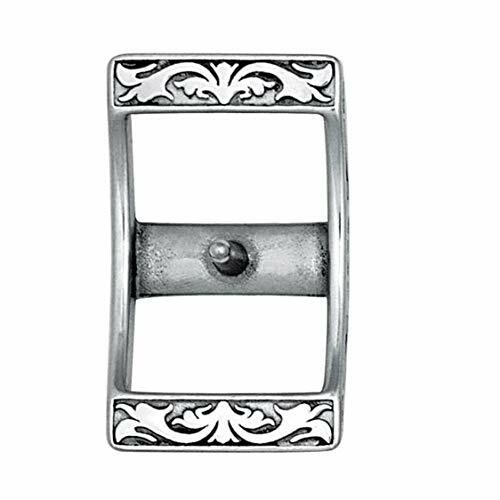 Jeremiah Watt Floral Conway Buckle Stainless Steel 5/8"
KEEP EVERYTHING NEATLY STORED: No more tossing your bridle wherever there's room or hanging it on whatever hook you can find. Keep all of your spaces neat and tidy by installing this heavy-duty Metal Bridle Rack from Intrepid International and never deal with clutter again. 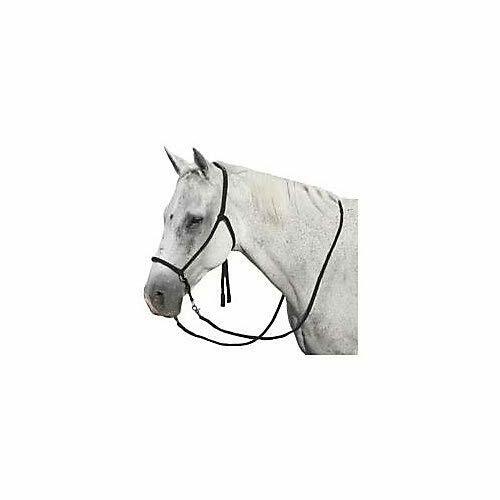 GREAT OPTION FOR RETIRED BRIDLES: If you have a special bridle or one with sentimental value that you only like to use sometimes, this is a great way to keep it stored safely. It's also excellent for a barn or stable decoration piece. 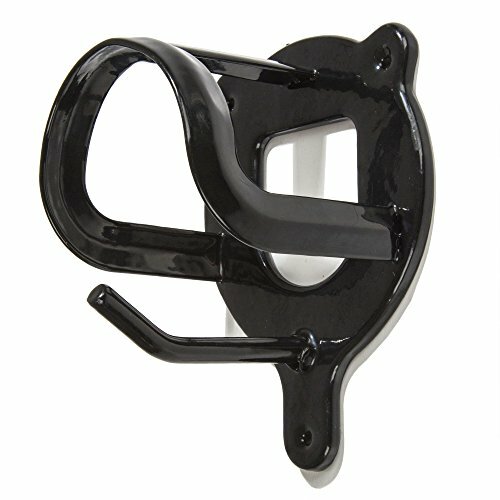 HEAVY DUTY CONSTRUCTION: This Horse Bridle Rack is made of heavy duty metal to withstand the weight of your heaviest bridle and accessories. It is coated in plastic, giving it its shiny black color and sheen and minimizing the scratches to keep your space neat and clean. 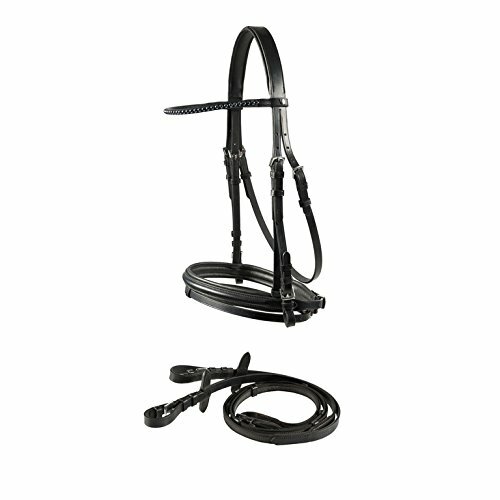 PRODUCT SPECIFICATIONS: Package contains (1) Intrepid International Horse Bridle Rack, Black. Metal with plastic coating. A very popular item for tack rooms and stall doors. Also, great for organizing your mud room closet. Silver Fox (R) Raised Snaffle Bridle Traditional style raised browband and caveson enhances even the finest horse's head. Quality standard leather with leather laced reins. Bit not included. Item Specifications: Measurements: Horse: 15" Brow, 34-40" Bit to Bit, Noseband 22-26" Cob: 14" Brow, 33-39" Bit to Bit, Noseband 21-25" Pony: 14" Brow, 32-38" Bit to Bit, Noseband 20-24"
This doubled and stitched 5/8" curb strap is constructed from smooth, refined bridle leather with smoothed and darkened edges that are easy on your horse's chin. Durable nickel plated hardware. 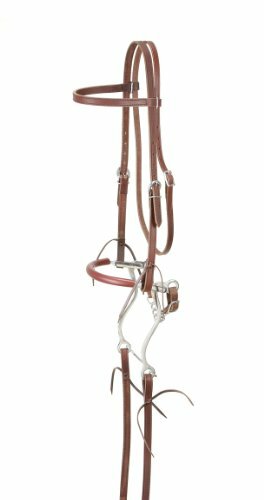 Get everything you want in the Silver Fox Raised Snaffle Bridle with Reins. 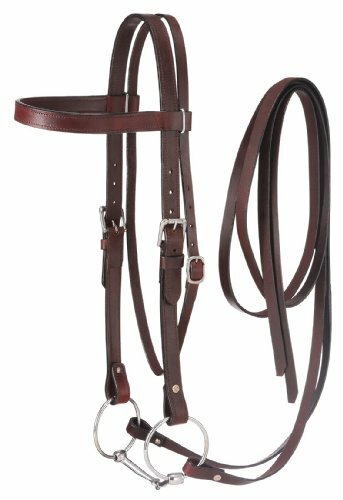 Made of durable leather in a rich brown, this bridle features a raised browband and cavesson. Included web reins make for a complete package. It's a perfect training tool for performing horses. About JT International For over 35 years, JT International has been providing riders with quality equestrian equipment designed to maximize the riding experience. With over 1,100 different types of products available, they offer new and time-honored favorites to riders all over the world. From tack to training supplies, JT International has each rider and their mount covered. Made of durable leather in rich brown. Handcrafted, quality raised browband and cavesson. Comes with web reins. Perfect training tool for performing horses. 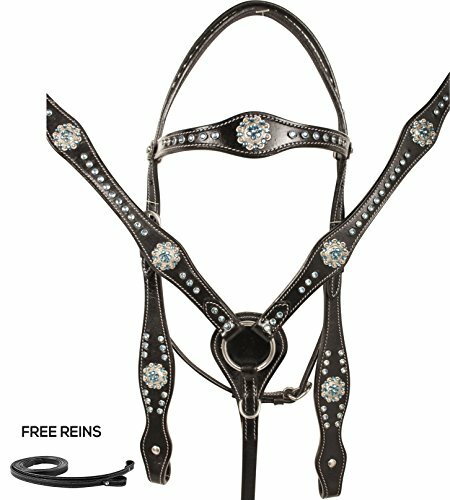 The Silver Fox Walking Horse Bridle looks downright foxy. 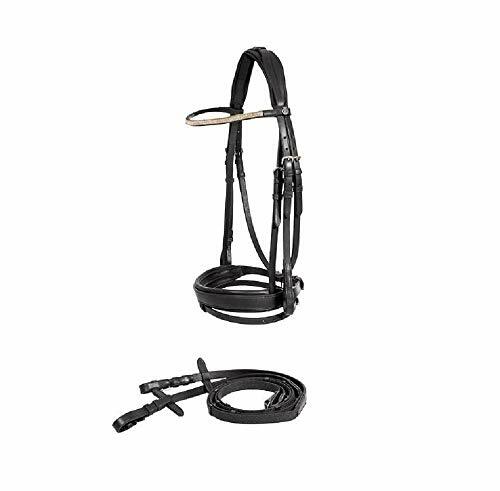 Crafted of durable, high-quality leather to fit draft horses, this bridle comes complete with fancy colored browband and cavesson. Available in a variety of colors so you can customize your look, it's perfect for keeping your horse in control. About JT International For over 35 years, JT International has been providing riders with quality equestrian equipment designed to maximize the riding experience. With over 1,100 different types of products available, they offer new and time-honored favorites to riders all over the world. From tack to training supplies, JT International has each rider and their mount covered. High-quality leather to fit draft horses. Complete with fancy colored browband and cavesson. Choose from various color options. Great for keeping your horse in control. 5/8" Jeremiah Watt Antiqued Stainless Steel Floral Conway Buckle. Add a touch of rich design to your project for a classy look with effortless adjusting, This conway buckle features a longer design that allows for easier adjustment, Perfect addition to any fine piece of leather work, Designed with more curve so it lays nicer, Stainless steel with black inlay. Size: 5/8" fits up to 5/8" straps. This is for 1 piece. fits up to 5/8 straps. 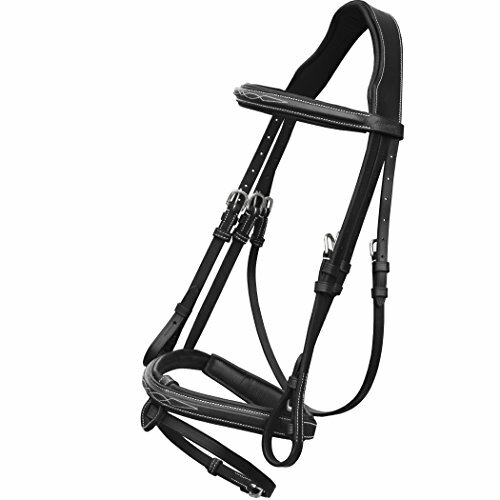 The lovely Remont bridle is perfect for young horses. A lovely raised square design on the noseband of the Horze Bergen Leather Remont Bridle adds a classic accent. The soft leather will last with proper care and is soft and flexible against the horse's skin. Remont, or dropped nosebands are perfect for young or sensitive horses, as the fastening is below the snaffle and doesn't pinch the teeth. A wide, soft, padded noseband and a lovely rhinestone-encrusted browband looks attractive on most horses. 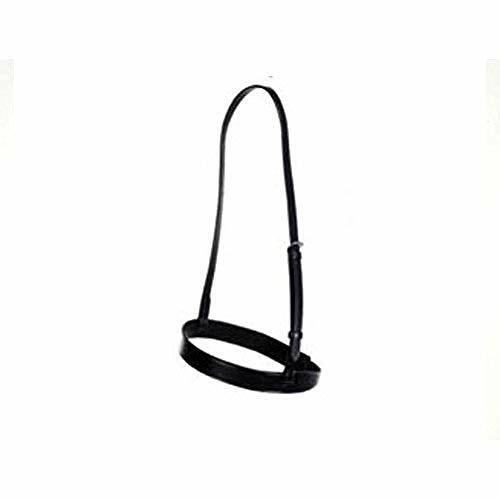 The quality leather bridle has a U-shaped browband and a traditional plain noseband with soft padding. Reins not included. 100% leather. Wipe with damp cloth after use. Clean with proper leather care products. Fully adjustable figure 8 noseband for a custom fit! Matching raised fancy stitched rubber reins included. Bridle only. Horse not included. Fine quality bridle leather, smoothed and darkened edges. Doubled and stitched. Complete with reins, curb chain and hackamore. 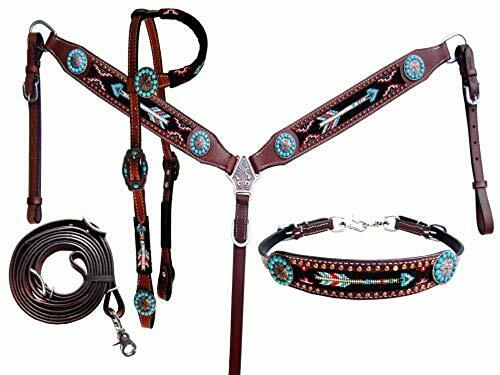 Showman 4 Piece beaded arrow headstall and breast collar set. 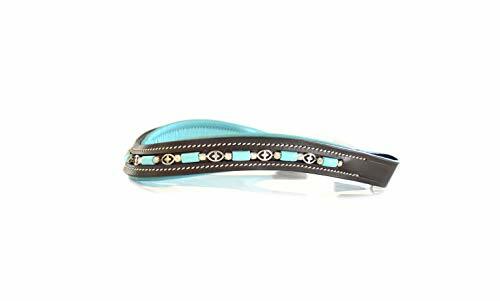 This set features medium leather with a beaded arrow design inlay and is accented with turquoise stone arrow conchos. 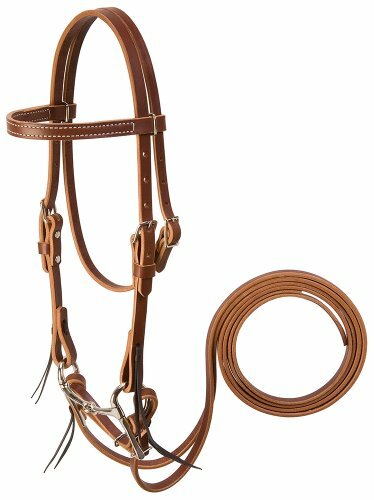 This set comes with single ear headstall, breast collar, wither strap and contest reins. 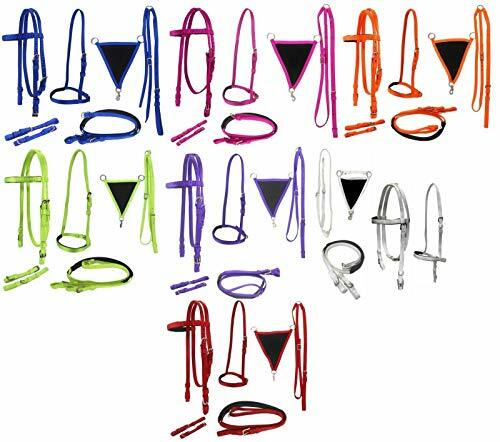 Elite Dutch Drop Design browbands in various designs. 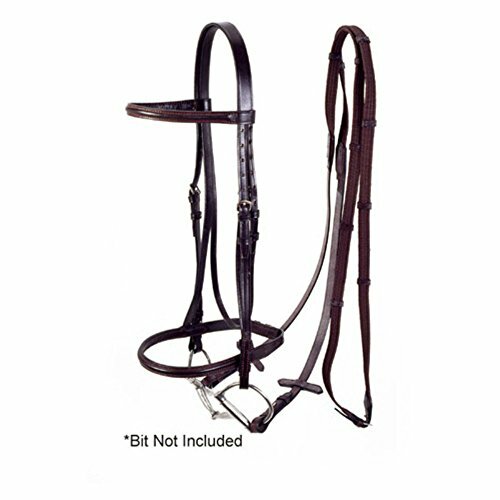 A classically designed fancy Square raised bridle from house of Exion Internationals. It is a prime quality unique product with 35 mm broad monochromatic head piece. Extra broad head piece releases maximum pressure from the neck of the animal. Soft yet Strong PP inserted 16 mm Rubber grip reins with Martingale stoppers will not move out from the comfort grip of user hands. Crafted with marvelous quality vegetable tanned drum dyed leather with perfectly square raised & precisely stitched with designer fancy touch on Nose band and Brow band along with detachable flash. This is a very rich quality product crafted with premier quality vegetable tanned drum dyed leather which is the best and foremost used in the Asian continent and delivers smooth finish along with attractive looks for schooling purposes and show ring. Smoothly finished and curved with special polish & lacquered on premium quality of Stainless Steel Buckles for long lasting results. It is a prime quality unique product with 35 mm broad monochromatic head piece. Extra broad head piece releases maximum pressure from the neck of the animal. Besides, it makes the product very appealing. Can be bought as a replacement for a raised nose band. Ideal for native breeds in the show ring. 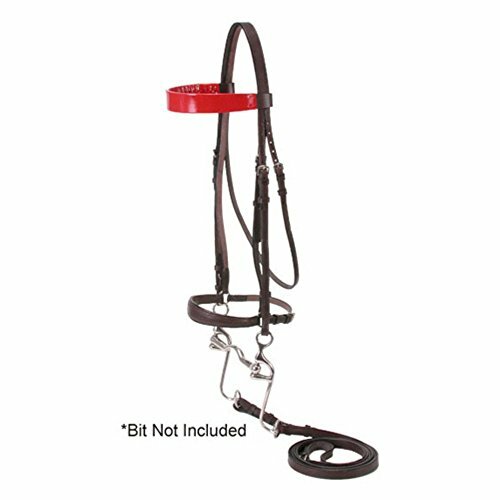 Beautifully crafted traditionally raised flash bridle from house of Exion International. This is a very rich quality product with perfectly raised, precisely stitched. Crafted with elite quality Vegetable tanned drum dyed leather, which is the best and foremost used in the Asian continent and delivers smooth finish along with attractive looks for schooling purposes and show ring. A top end product anti-pressure monochromatic head piece, anatomically shaped making free space for ear. Anti-Pressure headpiece releases maximum pressure from the neck of the animal. 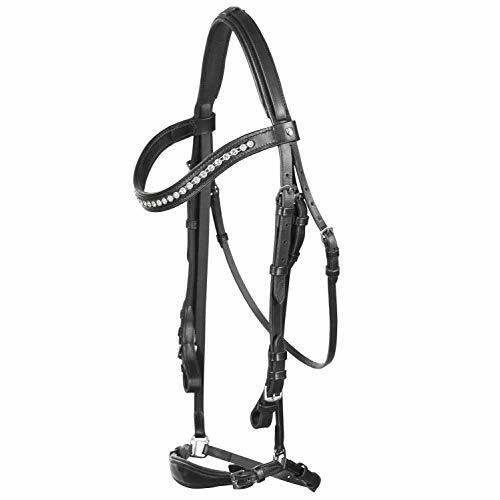 Beautifully crafted traditionally raised flash bridle from house of Exion International. Fabricated with top end quality of vegetable tanned leather with perfectly raised, precisely stitched. This is a very rich quality product crafted with elite quality Vegetable tanned drum dyed leather which is the best and foremost used in the Asian continent and delivers smooth finish along with attractive looks for schooling purposes and show ring. A top end product anti-pressure monochromatic head piece, anatomically shaped making free space for ear. Anti-Pressure headpiece releases maximum pressure from the neck of the animal. Besides, it makes the product appealing. Added stitching on this soft, padded leather adds to the beauty of this snaffle bridle for pleasure riding or the show ring. 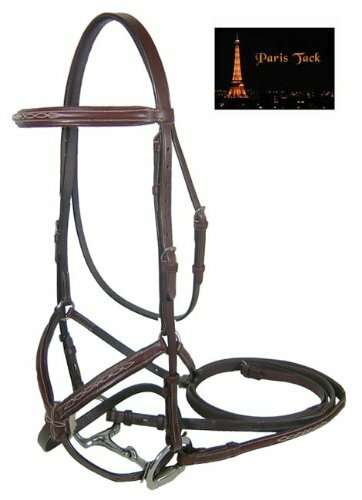 The padded leather browband is sturdy and strong and the matching noseband frames the face with extra fancy stitching. Choose to ride with the detachable flash when you need a bit of extra control. The crownpiece with leather lining and a comfortable anatomically-designed shape adds comfort. 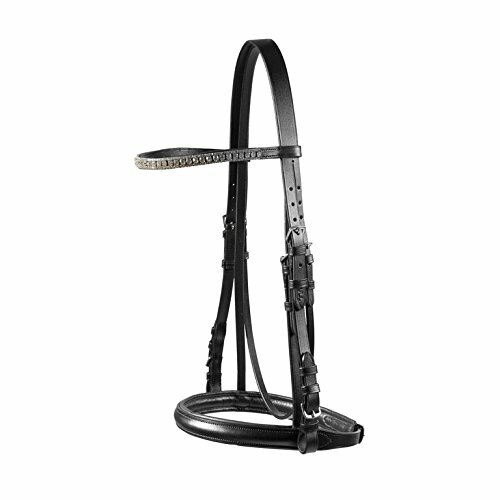 A lovely browband is an added bonus on this value-priced bridle. You will stay on budget with this nice leather snaffle bridle with a pearl-covered U-shaped browband in subtle, classic colors. 100% Leather. Wipe with damp cloth after use. Clean with proper leather care products.